Quick and easy cookies, chock-full of flavor – chocolate, oats, cranberries, coconut, pecans enveloped in a buttery, vanilla cookie. Check out the recipe HERE. For me, the Maine Lobster Festival has always signaled the beginning of the end of summer. Folks are wrapping up their summer vacations and getting kids ready to go back to school. This year, being a part of the 70th, was the biggest professional event so far of my new writing career and it was a fantastic experience! I was there Saturday and Sunday from 12p.m. to 4p.m. Thousands of people walked by my table during those hours, some stopped, some didn’t. My table was along the center line of the tent, with walkways in front and behind me. There were several authors and book vendors in the tent as well as a man who demonstrated modern lobster trap building, vendors who sold handmade Maine crafts, Maine themed t-shirts among others. One of the biggest draws, however, was the marine life touch tank situated at the far end of the tent on the water side. This, for many, was the main attraction of the tent. Kids and adults alike love the touch tank where you can get an up close look at small marine life and even pick some of it up if you dare. The challenge of being a vendor before the touch tank is getting people to stop at your table. This takes some skill, and there was definitely a learning curve for me. What saved me most of the time was the swag, and the candy. With the help of Dave Dailey, my graphic designer extraordinaire, we designed a commemorative magnet to give away , and I also had a free raffle to give away a couple limited edition The Empire / Maine Lobster Festival t-shirts. The bowl of vintage type candy – mini rolls of Necco Wafers, Tootsie Rolls, salt water taffy and lollipops also attracted people. There was a lot of trial and error in learning to get people’s attention, but I feel like by midway I had developed a pretty good spiel. My swag consisted of a postcard that has the book cover on one side and on the back is a quick biography of me, and a condensed blurb about the book, all my social media contact info, as well as QR code and where online the book can be purchased. I would stand with a postcard and magnet in my hand and try to make eye contact, or I’d yell “free raffle!” which sometimes helped slow people down as they walked by. Once that happened I’d hand them the swag and go into a quick speech about the book. Sometimes it ended in a sale, but either way they walked off with information about the book and where to buy it. A month has gone by since the festival, and now summer really is coming to a close. Labor Day weekend 2017 is in the books, kids are back to school. Soon the weather will start to cool and we’ll start dreaming of next summer. In the meantime, I have book 2 to finish writing and new swag to design for Maine Lobster Festival 2018. Hope to see you there! It’s opening day of the 70th Maine Lobster Festival in Rockland Maine. A tradition ingrained in the lives and memories of Rockland residents for generations. Every year, the festival welcomes thousands of people from around the world to the coastal town of Rockland; an industrial town turned art and culture community. The Festival offers something for everyone – carnival rides, games, live entertainment, fine art and crafts, and educational exhibits about living and working on and off the rocky shores of the Maine coast. One of the biggest draws, however, is the fresh lobster and seafood. 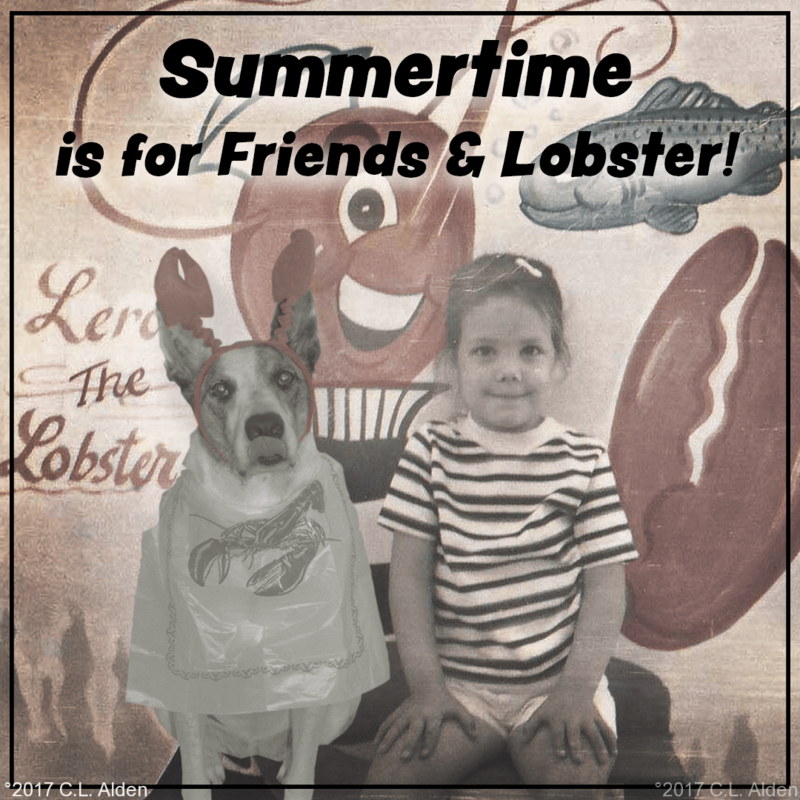 Thousands of pounds of fresh Maine lobster are cooked daily in a ginormous lobster cooker and served in a traditional style with lots of melted butter, a dinner roll and corn on the cob. This year I’m so excited that I’ve been asked to be a part of all the fun! Saturday and Sunday, from noon to 4pm, I’ll be in the Marine tent signing copies of my book, The Empire. For me, what makes this such an honor is that the book is set in a fictional town inspired by Rockland and the MidCoast area. If you know the area and have read the book, you’ll have noticed that there are places in Shoreton that seem very similar to places in the Rockland area. The story is an homage to Rockland and also to small town America. The book centers around the real struggles that many quaint New England towns face – how to remain relevant in an ever-changing world while still honoring the past. I love Maine and the MidCoast area and I’m delighted that I get to be a part of this annual tradition. Stay tuned for more photos and updates about all the fun and excitement I encounter at the 70th Maine Lobster Festival! It’s the first day of summer. Time to load up the cooler, stock up on summer reading material and sunblock, and head to your favorite outdoor destination. Whether it’s lounging at the beach, at the lake, or poolside, nothing beats a comfortable spot, a cool drink, and a good book! I’m EXCITED to announce the first book signing for The Empire will be in Rockland, Maine at the Strand Theatre! It seems appropriate that MY FIRST book signing will be at a theater that is very special to me, as well as one of the main inspirations for The Empire. Rockland and the MidCoast area also inspired the location of the story. Please join us! BOOKS, GIVEAWAYS, and a RAFFLE! I’m very excited to announce the launch of my first novel, The Empire! The Empire is a rural New England fantasy story that takes place in a small quaint coastal Maine town that is struggling to remain relevant in today’s modern world. Darcy Adams returns home to find herself embroiled in the middle of a paranormal clash between the town and it’s past. Can Darcy find a way to satisfy the demands of history while ensuring the survival of her town? Books make AWESOME gifts! Wanna give this book as a gift this December? Click HERE and fill out the form, and I’ll mail you a signed postcard to give to the recipient.